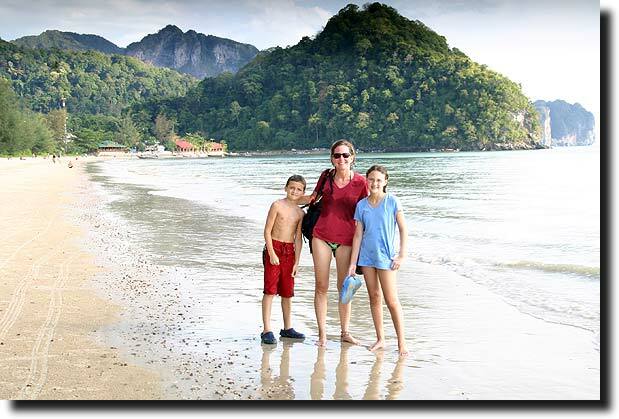 The final leg of our Thailand trip (after finishing with the zoo in Chiang Mai) was to the beach area near Krabi. Called Hat Noppharat Thara, we stayed in an Italian-run villa just off the beach and spent our days relaxing in the sun, swimming in the water, and diving in the pool. Because of the camera problems we experienced in Chiang Mai, we have no pictures of our beach excursions, as the sunlight washed everything out. We were able, however, to grab an evening picture of us with the beach in the background to give an idea of the beauty that surrounded us. 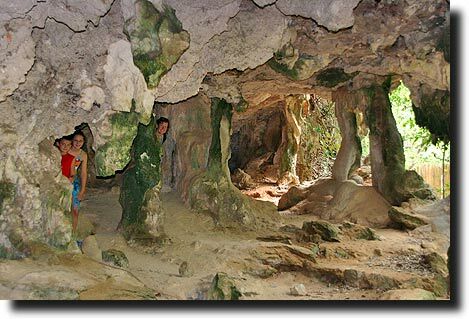 We were in the midst of great natural beauty, as well as a well-traveled tourist hub. 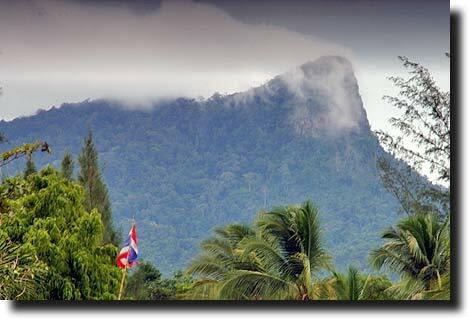 Every day as we walked to the beach we saw the cloud covered mountains that ringed the valley, and every evening we would hear the mobile advertisements for the Muy Thai boxing matches ("9 fights at 9!"). 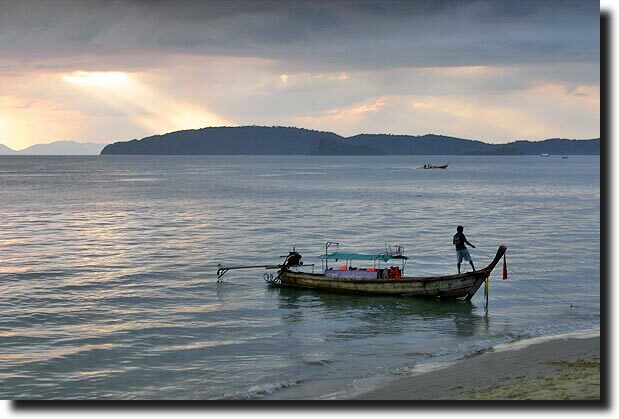 We were able to do a lot of beach combing and soul relaxing under the big Thai sky. 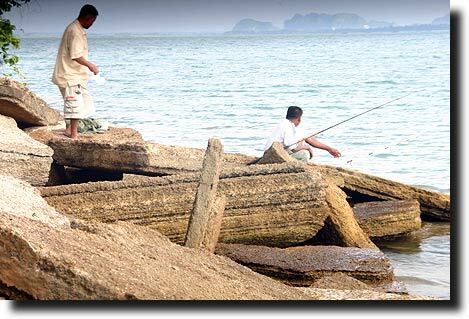 Because the shallow waters stretch out so far, this area was relatively unscathed by the tsunami, and were were able to walk across the bay to Kao Pak Klong Island at low tide. The beaches were inhabited by sand crabs that made ornate spiral patterns as they sucked up nutrients from the sand, and Breck's favorite way of ending the day was with a solitary sunset dip in the grand Indian Ocean. 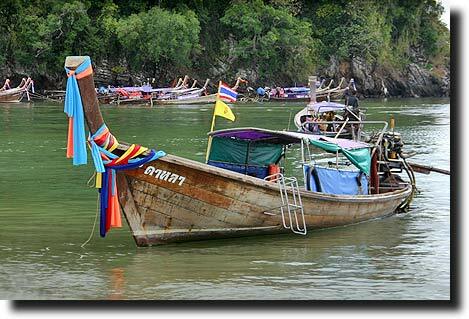 Longtail boats like those we'd seen in Bangkok plied routes between the various islands, always decorated with ribbons and flags. One afternoon we stopped off at "Fossil Beach," where solid slabs of rock made wholesale out of shells provided an easy seating spot for local fishermen. 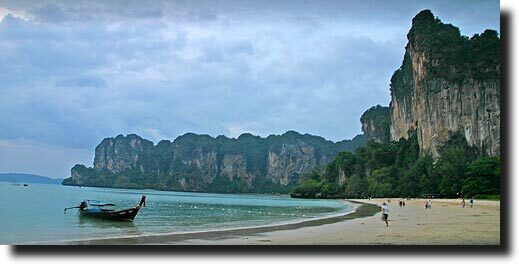 But Krabi is not only sand and surf. 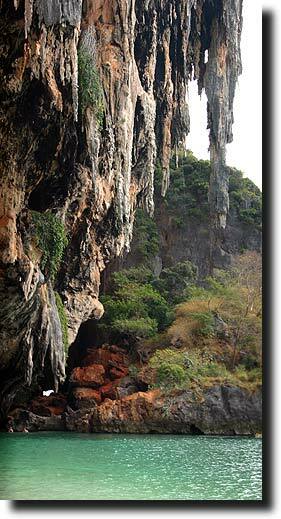 It is also home to fabulous natural water, jungle, and rock formations. We spent a day on motorscooters (ala Goa), zipping around and checking out the sights, and made our way to Khao Phanom Bencha National Park. After a quick drink, we hiked up to the waterfalls for which the area is famous. 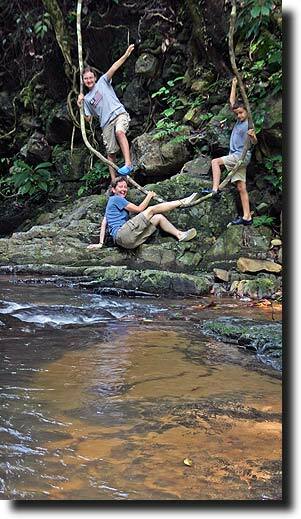 Along the way, the family did their best Indiana Jones imitations, mugging for the camera and having a great time. At the top, we realized that the backpack with Alea's new camera (along with the kids' swimsuits and some of Breck's new toys) had been left behind at the snack shop. 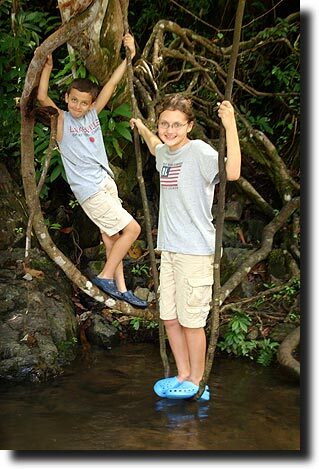 Susan and Alea went back to look for it, but of course it was gone, and with it all the great pictures she had taken. It was really a tough blow for Alea, and she was pretty inconsolable, and it threw a pall over the entire day. This was too bad, because we really did see some neat things and have a good time, but of course this loss was a big blow (especially given that A) it was her Christmas present, B) our other camera was on the fritz so we'd taken a ton of pictures with it, and C) it was only 3 days before the end of the vacation and thus no time to 'make up' the lost shots). 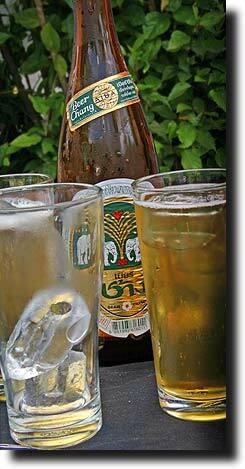 Drinking lots of beer the Thai way - with ice cubes in it - didn't hurt either. 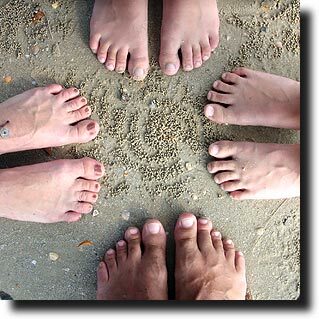 We contented ourselves with knowing that we were still ok, having fun, and in a fantastic part of the world. We went out on an island hopping tour the next day that gave us the chance to relax, snorkel, and put the bad events out of our mind. 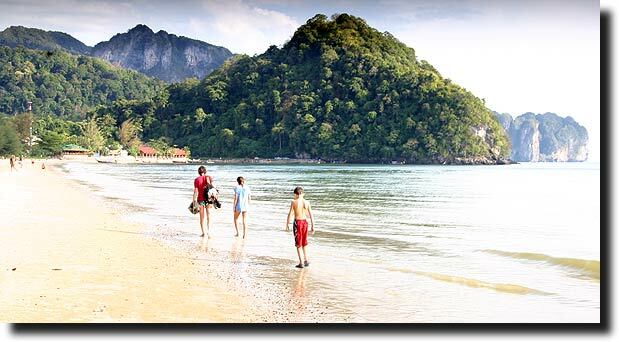 We headed to Railay beach one morning - meeting up crazily enough with a couple of younger Montanans on our taxi boat! 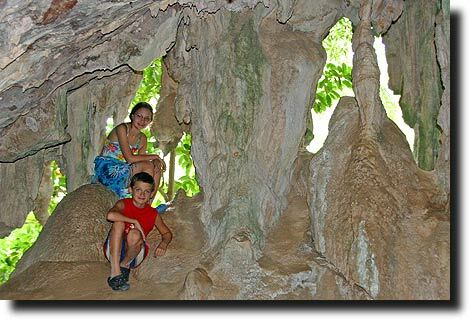 - and explored the caves on the way to the Phra Nang beach on the other side of the island. 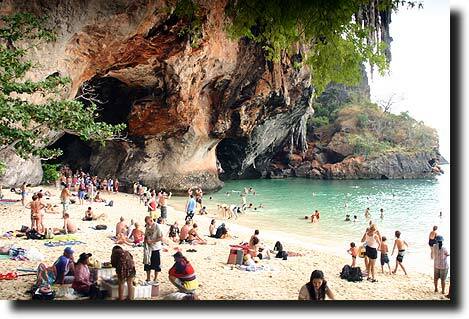 When we got to the shore, the scene was like something out of a tourist brochure - azure blue water, sharp stalactites hanging down, colorful fish, and of course tons of people! We all enjoyed just hanging on the beach and playing in the water, especially with the new snorkel equipment we had just bought! Dave even tried his had at cliff diving, although maybe his technique needs some work. 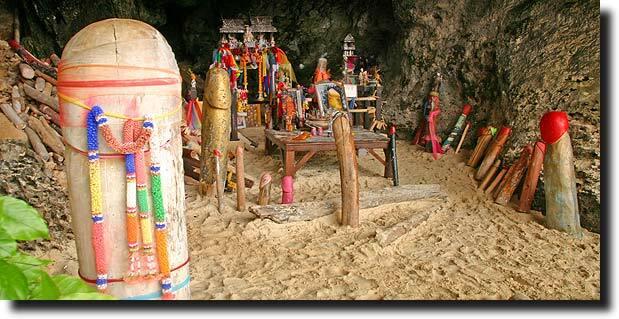 Stuck away at the edge of the beach was the (in)famous phallus cave, where local fishermen leave carved images and offerings in the hopes that local goddesses will help them sail safely, fish successfully, and hopefully get a head in life (groan). 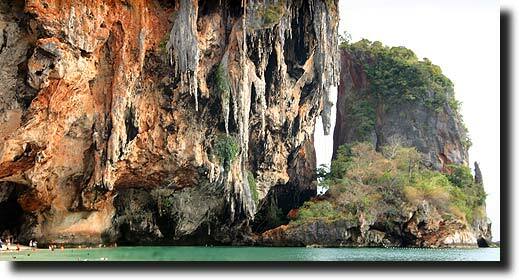 We hiked back along the east side of Railay and decided to have dinner at a place called Stella's - just because! 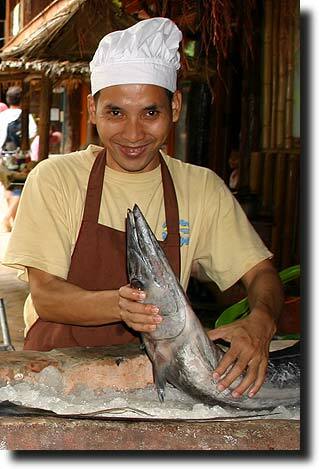 The daily catch was just making its way in, and the cook was only too happy to show off what was on the menu. We made it back to a nearly deserted beach, and waited for enough people to fill the boat for the ride back. Hot and sticky from a day in the sun, a relaxing evening spent looking out over the water was perfect. 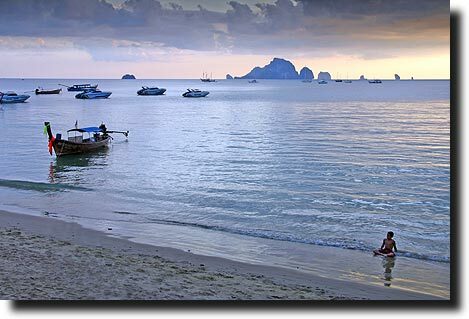 After nearly three weeks in Thailand, we can hardly say that we 'know' it, but what we can say is the parts of Thailand that we saw, we loved. 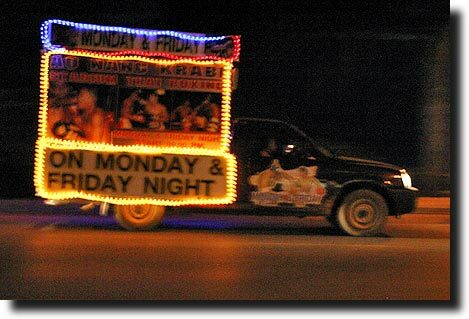 Who knows - maybe a return trip or even teaching position at some point. But for now, the sun goes down and the anchor is pulled up on yet another successful vacation.